this past weekend was the most anticipated weekend my family has had in a long time. my parent's stake held their stake conference and elder jeffrey r. holland and elder gary walker were there to participate...and with my dad serving in the stake presidency he was asked to host elder walker at his home for the weekend. we were able to hear my dad speak along side these great men. saturday night my dad introduced me and kevin to elder holland. elder holland gave me a hug, he said kind words about my dad and family, and then he told me and kevin to "be happy". we enjoyed a nice visit with elder walker saturday night at my parents home over pie. and sunday afternoon we were able to visit with elder walker over lunch at my parents home. their words during these meetings, and the conversations with elder walker in my parents home were so touching and revealed so much to me! these men have devoted their entire lives to this truth and have sacrificed much to serve, teach, and inspire. and even amid all this sacrifice they are happiest men i know! i am SO thankful for their strength, their example, and their love! a weekend not to be forgotten! kevin's sister, laura, came to visit us two weekends ago. we loved having her around and spent our weekend relaxing. laura was so nice to do just about anything the kids wanted her to do. such a nice aunt! thanks for coming laura! we hope you enjoyed your time here. staci and kyle came and spent the weekend with us. it was just like the good ole days except they got to sleep over and had to drive a couple hours to get home. (; we really enjoyed their company! it just wouldn't be right if wesley didn't get his nap on staci's lap. wesley, kevin, and madalyn. kevin looks a little tired. madalyn and i enjoyed watching from the bottom of the hill. on saturday we took advantage of our free afternoon and took the kids sledding. peterson park as the perfect hill for little ones to be able to climb up and sled down by themselves. we enjoyed ourselves! the hill was REALLY slick. here is kevin trying to help wesley get up. his efforts failed and they both came down. it didn't take us long to find the best spots to do our ascending. we are trying to decide whether to give up the first nap of the day. sometimes it works...and sometimes it doesn't. now that the holidays are done and past it's easier to find time for playing outside. so, madalyn finally doned her new snowclothes this week and ventured outside. i took ALOT of pictures because to be honest with you, i wasn't sure when she would be going out again. (; but, she did look adorable! she liked to shuffle along in the snow...and that was about it. she wasn't too impressed with this white powder. we played outside while owen was at school on friday. i tied a rope around myself and pulled them around on sleds...pretty good exercise i tell ya! wesley LOVES the snow! he had so much fun playing on the drifts along our driveway. and he REALLY loved when i would fly him over the drifts on the sled. such fun! it actually brought back a lot of memories from my childhood. this little guy knows a thing or two about how to relax! kevin and wesley went outside to play monday afternoon. it was too cold for everyone but they seemed to have a good time. kevin's angel. it's almost glowing...right?! i love the little trail they leave behind as they play. madalyn LOVES to brush her teeth. as soon as she gets her pj's on, or as soon as she sees someone else brushing their teeth, she is RUSHING to the linen closet begging me to get her tooth brush out. 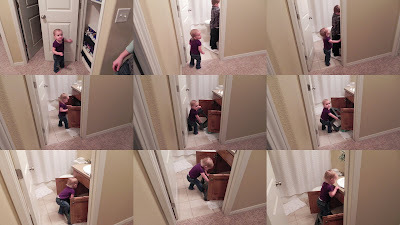 then, she dashes to the bathroom, gets the "ladder" out, and gets to work. she really loves it! which will hopefully be a good omen of what is to come with those little teeth. and she usually has A LOT of support! i am so excited for this new year. i love the decision making the months prior on what i would like to do better the next year. sure, every few months i am reevaluating myself and setting goals but goals at the beginning of the year are just more exciting to me. i'm excited about these goals! i would appreciate any and all recycling and repurposing ideas. already (in the first 3 days of this year) i have increased my food storage by 3 gallons of water thanks to repurposing and have decreased my waste by DRASTIC measures. my garbage man is going to wonder what happened! the first sunday of the new year means changes at church. a new meeting time (9am) and new classes for the primary kids. madalyn is now "officially" in nursery. she has actually been going for a month now and she has loved it. wesley has graduated from nursery and is now a SUNBEAM! he was really starting to feel OLD in the nursery...especially since madalyn had been joining him the last few times. owen is now a ctr 6. he was so excited that his teacher gave him a ctr ring!